Today: Stop avoiding kale. All it needs is a little massaging to reveal its soft, sweet -- well, sweeter -- side. You can't avoid kale. It's in salad! It's in pilaf! It's even where you'd least expect it: on pulled pork sandwiches! But then again, why would you want to avoid the leafy green that's turned the salad world on its head? Kale's healthy, easy to prepare, and with the right set of recipes, kale is downright delectable. "But," you'll argue, "kale is bitter, tough, and just plain unenjoyable." Don't worry: we've got a trick to solve that. 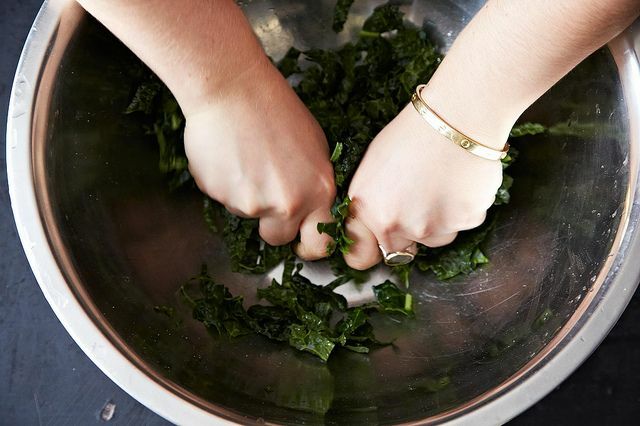 Give in to the kale craze. 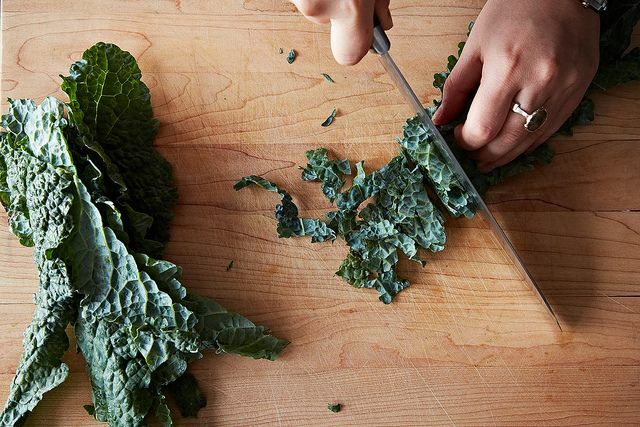 Pick up a bunch of those dark, leafy greens and get chopping. 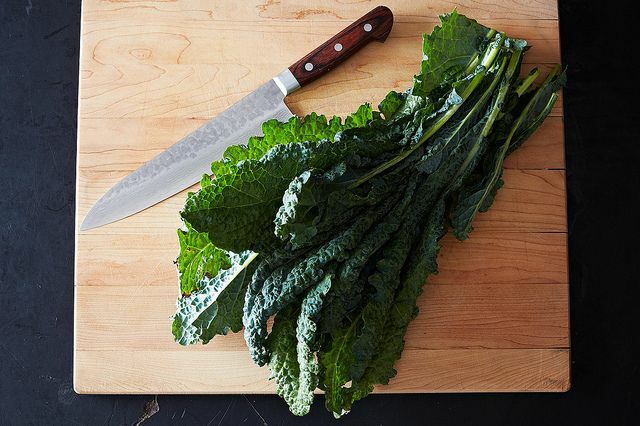 De-ribbing: Unless you're using baby kale, you'll probably want to remove the tough stems running down the center of the leaves. 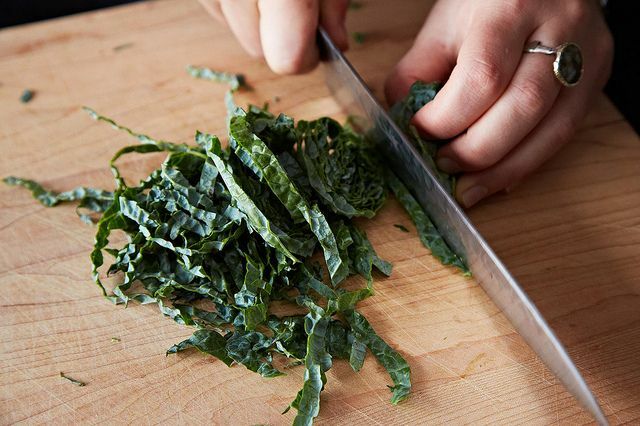 Chopping: If you're making a dish where you need big pieces of kale -- kale and corn quesadillas, kale chips, or a sausage and kale dinner tart, for example -- you don't have much work to do. 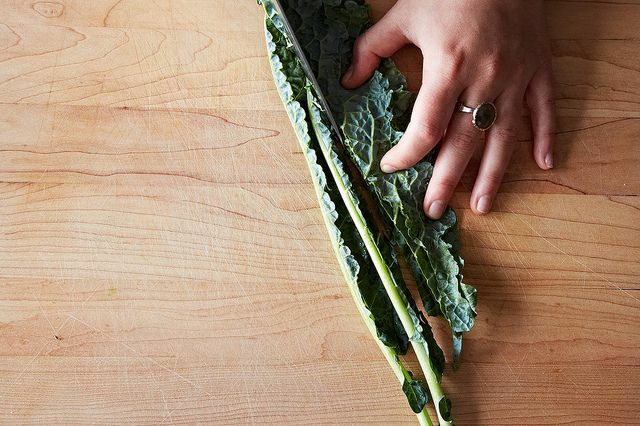 When you're planning to slice kale this thinly, you can get away with only removing the bottom part of the stems, depending on your preferences. 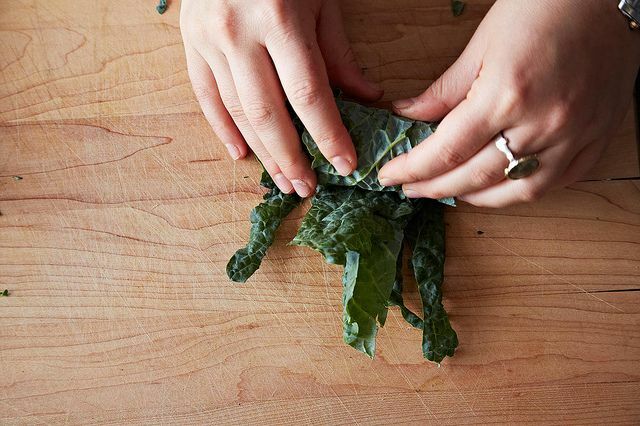 Tenderizing/Massaging: Known for being tough and bitter, all kale needs is a little massaging to reveal its soft, sweet -- well, sweeter -- side. Your kale -- feeling refreshed after a great massage -- is ready to be the base of the most delicious salad you'll ever eat. 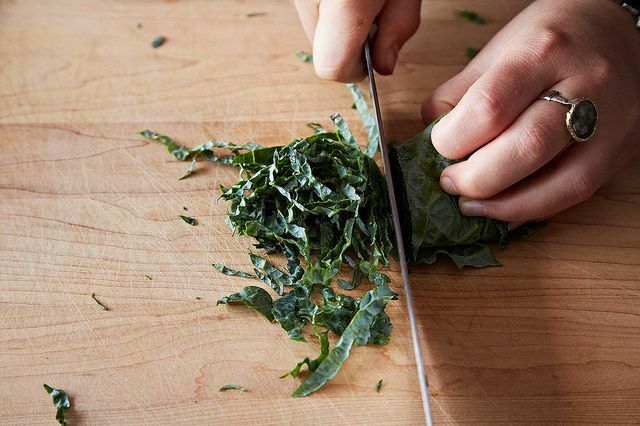 What's your favorite way to use kale? Tell us in the comments below! Kale, soba (udon is nice too) & walnuts. Cook all ingredients (Kale and udon in water & cook the walnuts in a hot pan with some butter or oil). Combine once cooked in a large bowl or one of the pans you used and add in some fresh Parmesan cheese and a pinch of pepper/salt/garlic. Toss and enjoy! This is great for houses that are divided meat eaters and vegetarians. I just found Food52 a while ago and I'm soooooo in love!! I get a LOT of email, but I could browse all day on one website....yours. I love reading and trying new things and I need look no further. I also just tried kale...and just bought some more. Now I see it has it's own 'press conference' today. So I'm checking to see what I want to do with this bunch. I think you've already decided for me. Thank you so much for creating Food52...I check here often for more ideas. 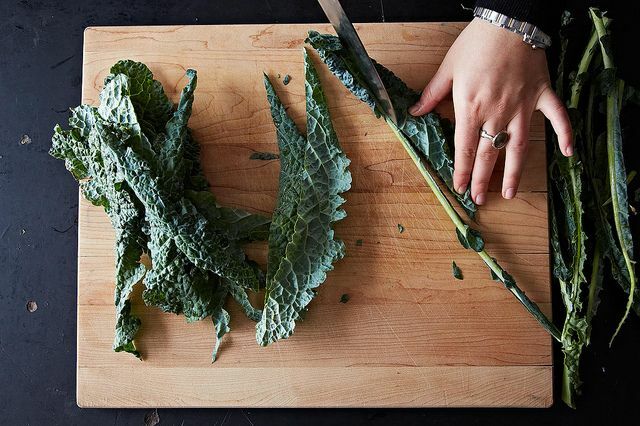 I discovered kale at Whole Foods and duplicated their recipes at home, until I found Food52. Your website is so awesome - instructions on prepping the veggies, shopping for utensils to do the job and tips to enhance your own recipes - I am so happy with Food52 I have become an affiliate, hoping to send all my foodie friends to you ! Any recommendations for mustard greens? How to clean, cook etc. thanks. I just yesterday returned from a trip to Tuscany. Lunch with a group of my winemaker friends on Saturday featured a crostini/bruschetta that was utterly simple and utterly delicious: cavolo nero cooked to just wilted, placed on a slice of rustic bread that had been rubbed with a garlic clove and brushed with the new olive oil from this year's harvest (olio novello). Bread. Garlic clove. Olio. Cavolo. And a pinch of salt. What could be easier? Been doing this for months, now addicted. Big bunch of organic kale, wash and dry throughly. Break off leaves, discard stems. Break leaves into small pieces and spray or toss them in enough olive oil to coat all sides. Then sprinkle with garlic powder and salt. Place in a large pan so they are not all crowed together and bake for 20-25 minutes @ 290F. DELICIOUS! Thanks for the help! Bought my first bag today and have just been staring at it. I'll probably start by trying to strip it like a collard green, but the 'massage' technique definitely like like it's worth a try. Layer with Yukon Gold potatoes, 1/8" round slices and onion..with the potato as 1st and last layer. Baking dish, 350' oven, 35min. Perhaps cheese on top! Yum. I have more kale than I know what to do with. Planted in straw bales & it's prolific! 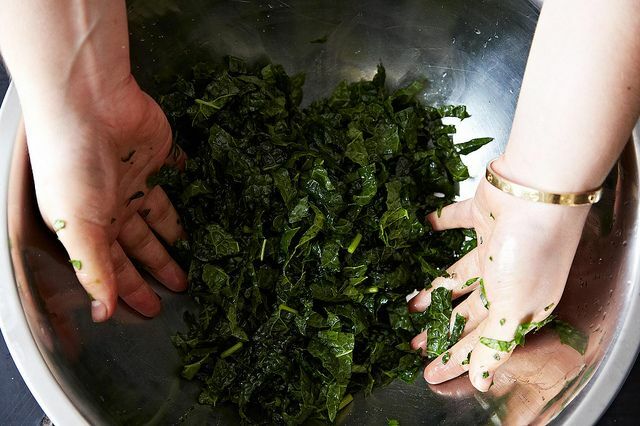 When cooking Kale, should it be massaged beforehand? I find it rather tough sometimes. Thanks. 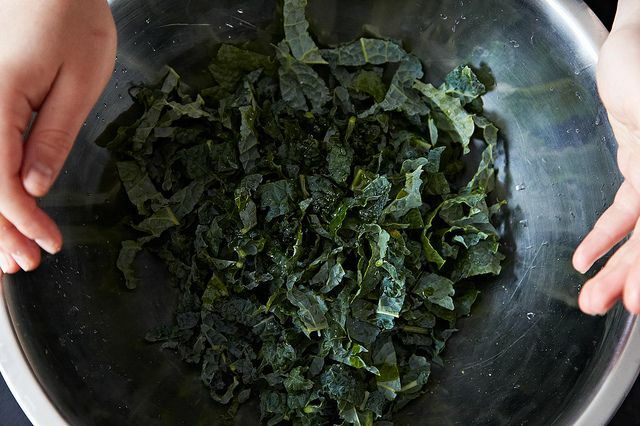 I have found that cavolo nero, aka "dino", or "dinosaur" kale, or lacinato kale, takes very well to freezing, which is helpful when I find myself with way more fresh leaves than I can use at one time. Remove the ribs. Chop or slice the leaves, if desired. Then simply blanche in hot water for 30 seconds or so, immerse in an ice bath, portion into ziplock bags, and store in the freezer. I ineveitably used mine within a month, but I'm guessing it would last longer. Even faster than slicing off the midrib (and another fun thing to do with your hands): strip the leaves! Hold the stem with one hand. With the other hand grasp the leaf where it meets the base and, pinching firmly, ziiiiiiip it off the midrib. I was just about to add that zipping off greens stems between index finger and thumb is more fun and faster when I saw your comment. Like minds! It is the best method and leads naturally to leaf massage. Sometimes I complain about kale that's cut into ribbons (sorry), so when I have extra time, I like to pull them into wider, oblong, irregular shapes -- kind of like in Amanda's salad (http://food52.com/blog/6154-kale-and-anchovy-salad). It makes it easier to spear individual pieces. A-ha! Torn kale! Just goes to show that the most useful kitchen tool is, more often than not, the hands.